The weekend promised to be a sunny one, despite the dirty tracks that Super Typhoon “Marce” had left when she touched down and sent rains, light it may be, all over the province of Antique, nay even the whole country. Let’s peek into a bit of history first before we plunge into the nature’s trekking activity of these environmental – friendly media personalities. During World War II Japanese occupied the country, not sparing the province of Antique. Libertad became the center of guerrilla activities where Colonel Cirilo Garcia and his men were victorious over the Japanese. The defeated Japanese warriors retaliated by burning the houses they would pass by in some villages. Like a phoenix emerging from the ravage of war, Libertad rose into a virginal and nature-endowed municipality and through the effort of the present administration under its lady mayor Mary Jean Nicopior Te, the town is slowly emerging as the “next tourist destination” in the northern part of Antique province. It was high noon when the group reached the poblacion and late lunch was served at Villa Teodora Beach Resort, just a few minutes’ drive from the municipal hall. 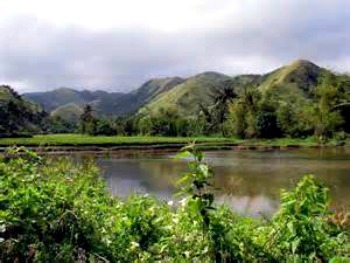 The first stopover was the “Kweba it mga Ati,” a good thirty minute walk along grassy trails. The cave was so named because it used to be the refuge of indigenous peoples (IPs) residing in this part of Libertad. The area surrounding the cave was so cool that Libertadnons chose this as the place fit to weave mats. Mat weaving, by the way, is the town’s major industry because “bariw” or screw-pine is so abundant in the area. In modern times, and as the populace expands into the vicinity, the cave was frequented by local people, first to weave mats because of its cool surroundings, and second to marvel at God’s creation. Libertadnons, it must be known, are adept at mat weaving. The process basically starts with the sun-dried “bariw.” These will be stroked with a wood and firmly rolled. Making it straight is easier when one does it in a cool surrounding, thus Kweba it mga Ati is the ideal place. (Bariw leaves easily get cracked when the air is humid and hot). The next process after straightening the bariw leaves is to slice it into strands and the weaving shall begin. The group proceeded to Bungan-bungan Spring, where the waters are free-flowing and so inviting that visitors cannot help but plunge into it. The water is also ideal for a therapeutic dip. The spring is surrounded with coconut plantations thus making it an idyllic place for family picnics. Just a few meters from the spring is the very famous Maanghit Cave situated amid a rain forest. The cave was so named because of the presence of more than 500 brown bats that made the cave their home for several decades now. The smell may be ghastly but the urge to get inside the cave has always been inviting. These webbed-wing mammals just drop their dirt from the ceiling where they cling to. The hard hats offered to visitors or the spelunkers make the activity easy. Extra care should be exercised though as the cave floor was slippery. There were bamboo handrails though with which the trekker can grip on. The cave entrance made the visitors open their mouths and eyes in wander. How did the Creator make the place so splendid and so fabulous? People would debate whether the entrance to the cave resembles that of a crocodile with crooked teeth or just plain rocks. Nope, these are not rocks either, these are stalactites or tapering structures hanging like an icicle from the roof of a cave. They were formed many centuries ago from calcium salts deposited by dripping waters. Inside the cave these stalactites “unite” with stalagmites or mounds of tapering column rising from the floor of a cave. Several unique formations of stalactites and stalagmites amused the visitors. At the end of the 50-meter cave was a small chamber where, as the guide pointed out, was the statue of “Blessed Virgin Mary.” It was a stalagmite indeed that rose from the cave floor and shaped itself into a statue that resembles Mother Mary. There were also different kinds of spiders, big and small. The group even saw a giant tarantula. Did anyone expect a venomous snake? The group also decided to pass through a small channel which led to an underground river. The municipal tourism officer Galahad G. Garcia, who also acted as the tour guide, informed the group that the water from that underground river flows straight into Bungan-bungan Spring. Night fell into the town of Libertad and everything got so quiet. Only the night birds and the soft murmur of the waves from the sea fronting Villa Teodora could be heard. The trekkers dozed off to dreamland. Sunday morning ushered in the days of the Advent. For Catholics it is the start of the merriest season of the year. For our trekkers, the sun rays that peeped into the glass windows of the villa where they slept ushered in another day of fun-trip, nature trek and travel down history lanes. The first stop over was the Northwest Panay Peninsula Nature’s Park situated at Sitio San Juan, Barangay San Roque. This peninsula filled with endemic trees and different flora and fauna was established through the government’s Presidential Decree number 186 on April 24, 2002. Then President Gloria Macapagal Arroyo made the declaration in order to save what needs to be saved. The Northwest Panay Peninsula comprised the width of almost 12,009.29 hectares and made up of five municipalities, three of which belong to Aklan province and two, Libertad and Pandan towns, belong to Antique province. The Department of Environment and Natural Resources (DENR) constructed its satellite office in this sitio. The personnel assigned here are tasked to monitor activities and to help conserve the naturalness of the area. Within the natural park is the famous Mt. Pinupo where minerals, marbles and iron ores are believed to be in abundance. It stands 600 feet above sea level. Old folks would tell that there was a giant clam that sits atop the peak of Mt. Pinupo. It could be a legend or just a story passed on by words of mouth but it made the trip more enjoyable. DENR also constructed a viewing deck fronting Mt. Pinupo and from here the visitor could see a splendid view of the whole town of Libertad. From here, the group went down and proceeded to “Parigusan it Pari” or as translated, the brook where Spanish friars used to take a bath. No exclamation was needed why the Spanish friars loved the place. Its bluish water could refresh the most tired soul and the trees of different species made the surroundings so spectacular and so groovy. A few meters from the brook stood another marvelous creation. A must-see when one plans to visit Libertad. Ever wonder why the town is known to be the marble capital of Antique? Well, the answer was supplied when the group saw the very tall Marble Wall – so amazing that one could wish a piece of marble would chip off and land into one’s back pack. Lunch was served and yet it was not the food that feed the visitors’ souls. It was the breath-taking view and the wonderful creation that Nature gifted to Libertad. The Libertad tour could not be completed without dropping by Barangay Pajo, a coastal village that boasts of live corals, colorful fishes and clams and star fishes. Geared up to snorkel, the visitors waded into the knee-deep sea water and met Nemo and Dory and their cousins. Well, the trip did not end there. There are still mountains and reefs to conquer and stories to tell. After the splendid weekend spent away from their comfort zones, the visitors bade their goodbyes to Libertad and pledged to come back for more. The author thought it was just a mere statement but after conquering half of Libertad, reality stroke back: The town boasts of marble deposits but its people have golden hearts.